Only a few things to mention... if you have any contributions or news to share, please let me know. "Our team is thrilled to announce that Konsiderate.com, a new community-driven ratings and review website for medical simulation products and services has just launched its Alpha phase. This new website was created to enable the thousands of simulation champions from around the world to share product and service experiences regarding quality, value and customer support from the increasing number of industry vendors. With review sites like angieslist.com, amazon.com, rottentomatoes.com, and yelp.com — the world is changing in the favor of customer. And why should it be any different for purchasers of medical simulation equipment or services? Konsiderate.com’s goal is to empower the professional community of simulation champions to make informed purchasing decisions through the collective help of their peers. What launch features are currently available to Konsiderate.com users? Easily login using your established professional LinkedIn profile. Write reviews of medical simulation products and services. Rate quality, value and customer service of your purchased products/services. Tag products/services for specific and searchable keyterms including names, procedures, features and more. See community reviews and their average “konsideratings” for all product/services rated. Read and vote on the most helpful product/service reviews. SimGHOSTS has announced that its USA event will be Aug 5th-8th in Chicago, Illinois at the new Innovation, Simulation, and Training Center. I got this in an email the other day - sadly I can't make IMSH this year... looks like fun! Smooth-On manufactures materials used for a variety of medical simulation applications. They allow you to make your own hyper realistic suture pads, injection pads and more. Centers currently using our materials to make their own devices are saving in the range of 80%-90% vs. buying commercially available products. We provide material knowledge and training to centers such as UCLA, Drexel University, Boston Children’s Hospital, Mayo Clinic, Alberta Health and several others around the world. One of our goals is to show you the significant savings that can be realized by making your own vs. buying commercially available products. 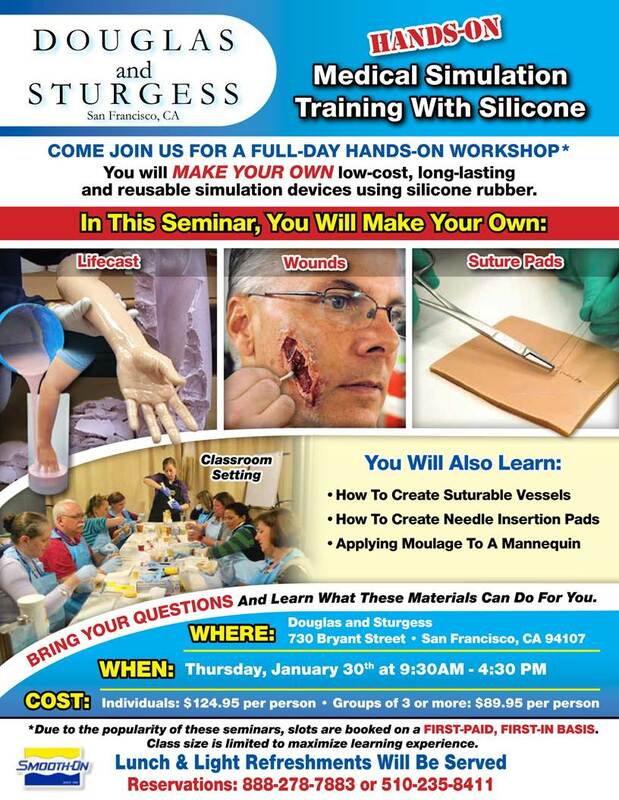 Anyone attending the seminar will leave with a working knowledge of materials and how to make hyper-realistic suture pads, injection pads, wound effects and more. I have attached the information for the San Francisco workshop we are having in January. This workshop will take place the day after the IMSH conference at a location nearby.